It is getting close to March, and as always Vodafone is starting its price drops on mobile phones. This time round they are dropping the prices of its BlackBerry handsets, they are also offering double minutes with the BlackBerry Curve 8520 for as little as Â£13 per month. There are a few deals, for the price of Â£13 per month that we mentioned above you can get your hands on the BlackBerry Curve 8520 with 100 minutes, 500 texts and 100 MB Data, this tariff would have normally cost customers Â£15.50 on the 24-month contract (Includes 500MB BT Openzone Wi-Fi access). 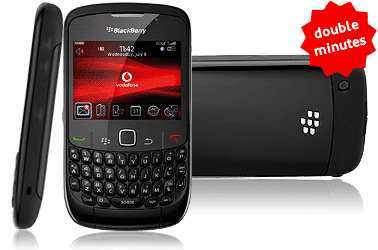 Please visit Vodafone to bag the black Curve 8520, if you fancy this handset in violet please visit here. These are just some of the amazing price drops Vodafone have to offer, will you be taking advantage on these contract bargains? One of the greatest Blackberry phones made ever is the Curve 8520, all my family are using the Blackberry curve 8520.. it’s a great phone.. Vodafone users will now enjoy this mobile phone with this great price..Â sounds like a really good deal.